There seems to be a conspiracy for my weight loss goals every year and I believe those cute little girls with the green sashes are part of it. It starts in October with Halloween and all the candy. Next, the best food holiday of the year, Thanksgiving. Then straight into the Christmas season with all of its wonderful treats and food. As the New Year rolls around I, and many others, decide its time to get off the junk food wagon and get in shape. But usually three weeks into the New Year along comes a knock at the door. Little girls with their order forms for those yummy GS cookies. There goes the diet. Don’t get me wrong, the Girl Scouts are a great organization. It would just be better if they sold their cookies in the middle of the summer. Who am I kidding, my diet and exercise program is undone by me. I guess with this dessert I am part of the conspiracy. Sorry!! Last week I needed to make a dish for my daughter’s teachers luncheon. I always take this opportunity to create a new dish. 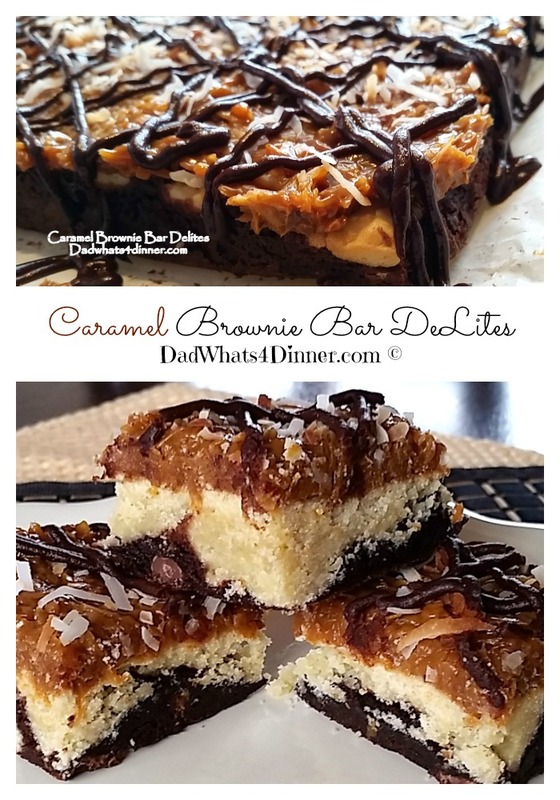 Caramel Brownie Bar DeLites is my take on one of the Girl Scouts most famous cookies the “Somoas or Caramel de-Lites” depending on which part of the country you live. The teachers loved it and I hope you do to. The Girl Scout bakeries describe Samoas as vanilla cookies dipped in caramel, topped with coconut and drizzled with chocolate. For the base I use a package of Ghirardelli® triple chocolate brownies. Any brownie mix will work. For caramel I use Nestlé® La Lechera® Dulce De Leche sweetened condensed milk. This is a great product to use in desserts that call for caramel. Preheat your oven to 350°. Line a 9 x 13 baking dish with parchment paper. Allow paper to extend over the edges of the dish to allow for easy removal of dessert. Lightly grease with cooking spray. For Brownie, blend water, oil and egg, until egg is lightly beaten. Stir into brownie mix until combined. Spread evenly in prepared baking dish. Bake for 5 minutes. To make your shortbread, cream together the sugar, butter and 2 tsp. vanilla with an electric mixer. Add the egg and beat until fluffy. Stir in the salt, then the flour, 1/2 cup at a time, until well mixed. Remove brownie from oven. Place shortbread dough over brownie in sheets. Try not to press the dough down into brownie. Return baking dish to oven. Bake 20 -25 minutes until shortbread is set and just beginning to turn golden brown. Cool completely. Lower oven temperature to 325°. Spread coconut evenly on cookie sheet. Bake in preheated oven 5-10 minutes. Flakes will toast quickly. Sweetened flakes will toast faster. Stir flakes after a few minutes to make sure you get even browning. Reserve 1/2 cup of coconut. Place can of Nestlé® La Lechera® Dulce De Leche in microwave safe bowl. Microwave 2 minutes, stir after 1st minute. Stir in toasted coconut. Spread evenly over cooled brownie-shortbread base. 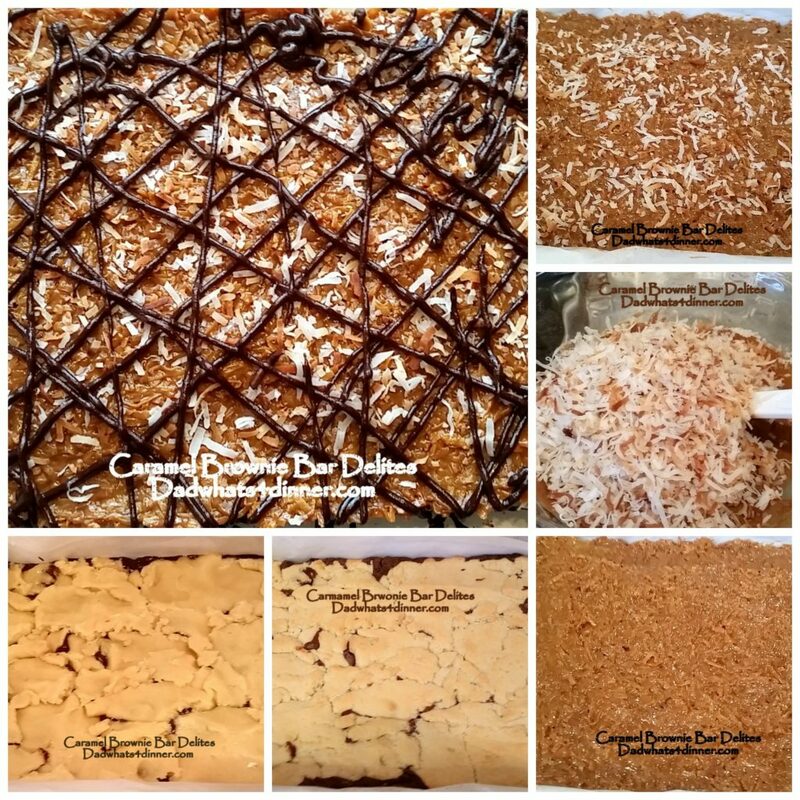 Top with remaining 1/2 cup toasted coconut. Refrigerate for at least an hour, or until the caramel layer is completely cooled. Remove the bars from the refrigerator. Combine heavy cream and 1 1/2 cups of chocolate chips. Melt in the microwave at 50% power, stirring every 1-2 minutes until smooth. 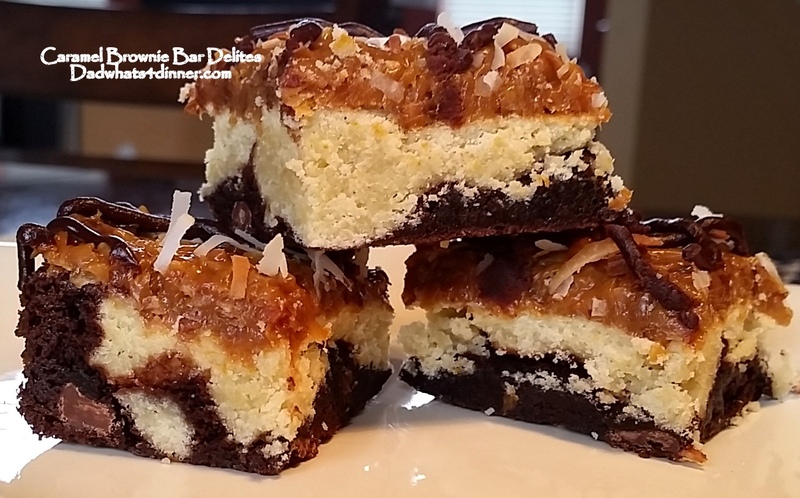 Drizzle chocolate over the top of the bars in a zigzag pattern. Chill for 1 hour in fridge. Remove from pan and cut into squares. 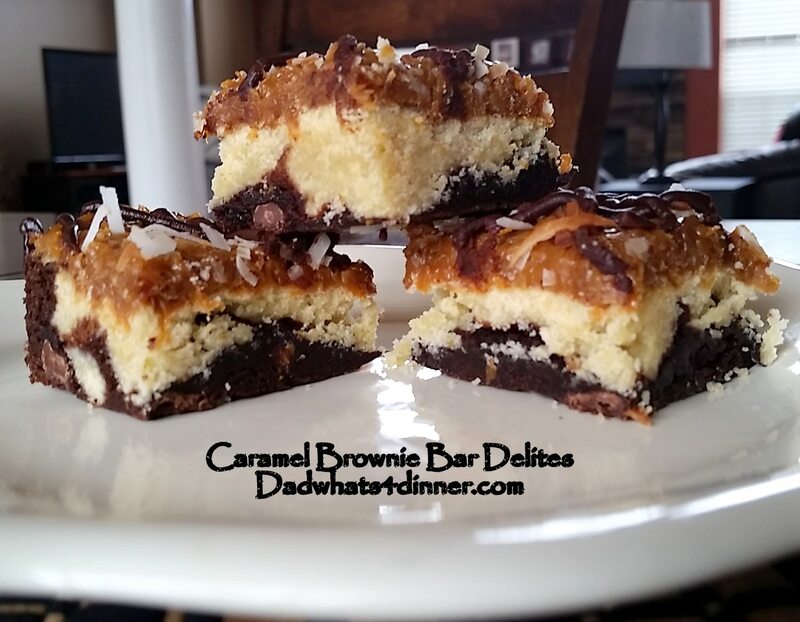 Caramel Brownie Bar DeLites is my take on one of the Girl Scouts most famous cookies the "Somoas or Caramel de-Lites" depending on where you live. Line a 9 x 13 baking dish with parchment paper. Allow paper to extend over the edges of the dish to allow for easy removal of dessert. Lightly grease with cooking spray. For Brownie, blend water, oil and egg, until egg is lightly beaten. Stir into brownie mix until combined. Spread evenly in prepared baking dish. Cream together sugar, butter and 2 tsp. vanilla with an electric mixer. Stir in the salt, then the flour, 1/2 cup at a time, until well mixed. Place shortbread dough over brownie in sheets. Try not to press the dough down into brownie. Return baking dish to oven. Bake 20 -25 minutes until shortbread is set and just beginning to turn golden brown. Spread coconut evenly on cookie sheet. Bake in preheated oven 5-10 minutes. Flakes will toast quickly. Sweetened flakes will toast faster. Stir flakes after a few minutes to make sure you get even browning. Reserve 1/2 cup of coconut. Place can of Nestlé® La Lechera® Dulce De Leche in microwave safe bowl. Microwave 2 minutes, stir after 1st minute. Spread evenly over cooled brownie-shortbread base. Top with remaining 1/2 cup toasted coconut. Refrigerate for at least an hour, or until the caramel layer is completely cooled. Remove the bars from the refrigerator. Combine heavy cream and 1 1/2 cups of chocolate chips. Melt in the microwave at 50% power, stirring every 1-2 minutes until smooth. 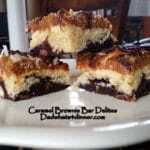 Drizzle chocolate over the top of the bars in a zigzag pattern. Chill for 1 hour in fridge. Remove from pan and cut into squares. Time does not include calling time in the fridge. 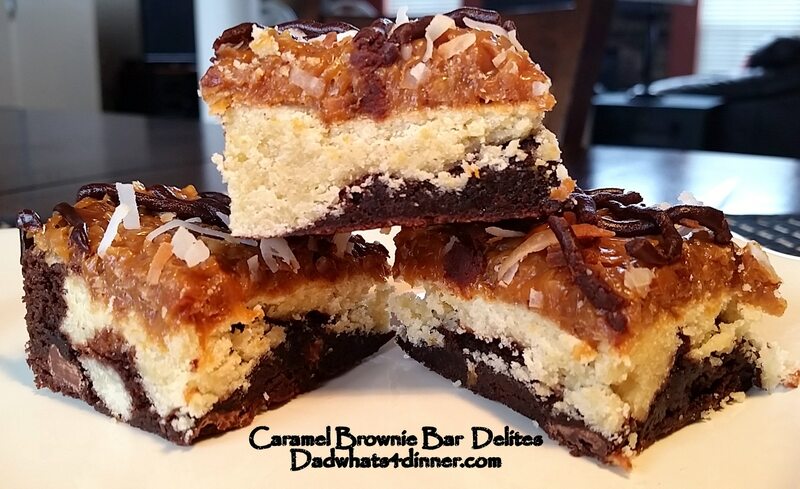 I also will be bringing Caramel Brownie Bar DeLites to Freedom Fridays, Friday Favorites, Fiesta Friday, Weekend Potluck, What’s Cooking Wednesdays. Checkout my Link Parties Page for other great places to find new recipes. Oh my goodness, these are my favorite Girl Scout cookies, well the only ones that I like, really! And these bars! I will not think about anything else until I make them! They look insanely good!